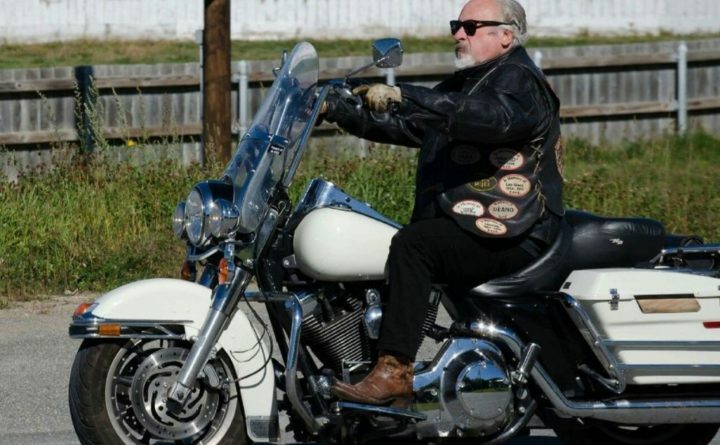 Bob Bowley, one of the founders of the Exiles Motorcycle Club, Maine's first biker club, died on June 15 at the age of 70 from an injury he received in a motorcycle crash. The thunder of several hundred motorcycles will echo down a 15-mile stretch of Route 1A starting in Brewer on Saturday, when Maine’s oldest bike club will ride in honor of a founding member who died last week. Robert “Bob” S. Bowley, one of 11 men who founded the Exiles Motorcycle Club in 1969, left his mark on generations of bikers by donating the group’s Dedham clubhouse. He died in the hospital Friday from injuries he received in a motorcycle crash the week before. He was 70. At 2 p.m. Saturday, Brewer will erupt with the sound of motorcycles as a fleet takes off from Brewsters on Wilson Street, the starting point of a memorial procession that pays him tribute, said Exiles member Matt Gould. It will be a fitting send-off for a man who rarely rode his bike long distances alone, Gould said. The ride is expected to draw hundreds of Exiles from across Maine, and will head down Route 1A until the group reaches a turn off near Green Lake Road in Dedham, Gould said. The bikers will end at the group’s clubhouse, which formerly belonged to Bowley’s mother, he said. Drivers along Route 1A should expect traffic delays between 2 p.m. and 2:30 p.m. in that area, said Gould, who was unsure whether police would block some of the local intersections so bikes can ride without stopping. The Brewer Police Department was not immediately able to say Wednesday whether they would help coordinate the ride. The procession will mark the second Exile memorial ride since November 2016, when a prospective club member tragically crashed his bike in Pittston during a ride to honor two members who were murdered earlier that fall, Gould said. A cycle crash cut Bowley’s life short, too. On June 8, he suffered a severe spinal cord injury when his 2005 Harley Davidson swerved into a ditch on Bucks Mill Road in Bucksport in order to avoid an oncoming car that had crossed the centerline, his daughter Dawn Brown said. Bowley died a week later, on June 15, in the ICU at Eastern Maine Medical Center, she said. Bowley is the second member of the Exiles’ 11 founding fathers to die, following George Veillette Jr. in 2013. The group was formed in Orrington in the late 1960s — when it was originally known as Iron Coffins — and became Maine’s first motorcycle club, Gould said. Since then, it has formed into three chapters, Gould said, who declined to say how many members there were. “It’s a man’s club. We get together and ride motorcycles. It’s a brotherhood. My brothers are my family,” he said. Saturday’s procession will begin after a memorial service for Bowley held at the Brewer Chapel at Brookings-Smith on Main Street, starting at 11 a.m. In addition to his daughter Dawn, Bowley is survived by his wife of 50 years, Ellen Bowley.